Rich, delicious semi-homemade brownie studded with chopped pecan pieces and a layer of gooey soft caramel in the middle. 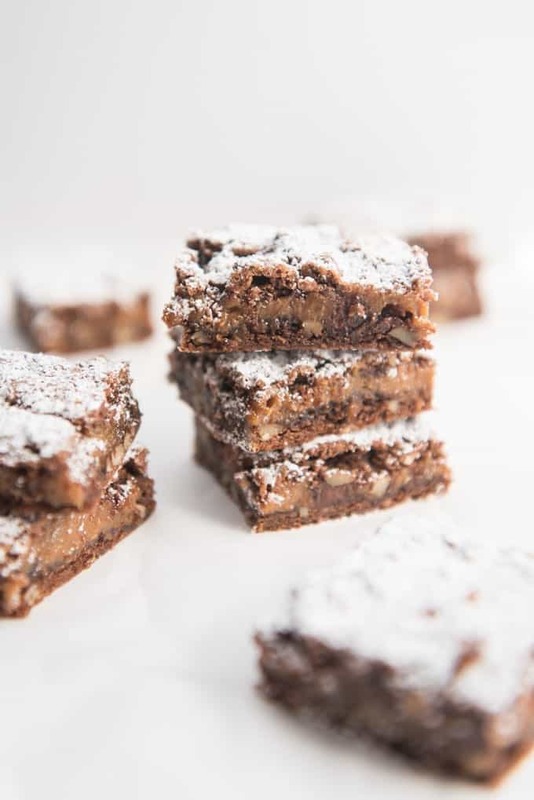 These easy caramel pecan brownies are definitely a family favorite! 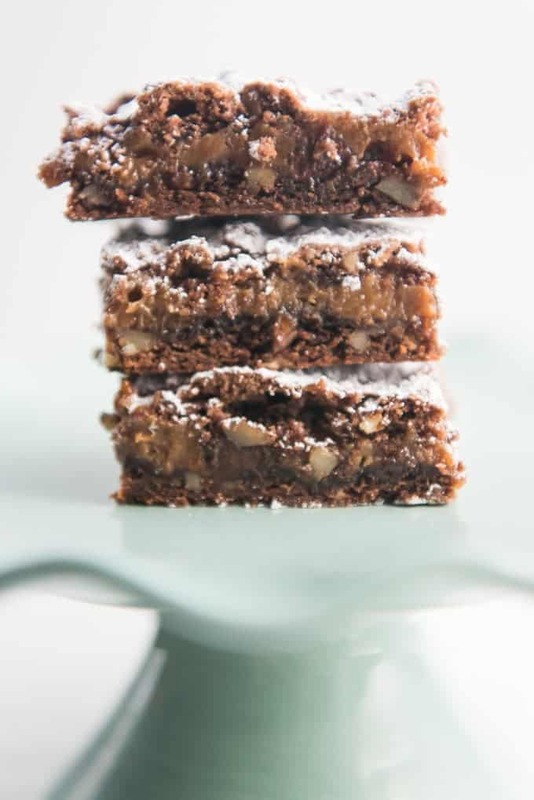 I distinctly remember the first time I ever had these easy caramel pecan brownies. I was in high school at a party that some of my parent’s friends were having at their lake house and they served these up cold from the refrigerator. Everybody went nuts. 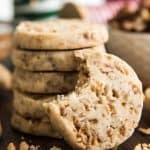 They were so delicious that I remember asking my mom to ask her friend if I could please, please, please have the recipe so I could make them again at home. The friend kindly shared her recipe and I think I probably made these once a week for the rest of high school. Or at least that is how I remember it, although I may have alternated between these caramel pecan brownies and my other guilty pleasure – chocolate cupcakes with rainbow chip frosting. I’m still obsessed with that stuff. 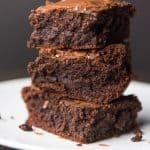 Food blogger pride aside, I have to admit that while I generally prefer my goodies to be homemade from scratch, there is just something about these semi-homemade brownies that start with a German chocolate cake mix that just rings every bell for me. It’s got the texture with the slightly crunchy pecans, the soft, gooey caramel, and the chewy brownie thing going on. And then dusting it with a sweet layer of powdered sugar just takes it to that next level. And they just turn out so well with a cake mix that I have never messed around with a brownie base from scratch to have these been 100% from scratch. I’m sure it can be done, but there are just some times when using a box cake mix works for me so I’m gonna’ own it. And I mean, just look at the texture! 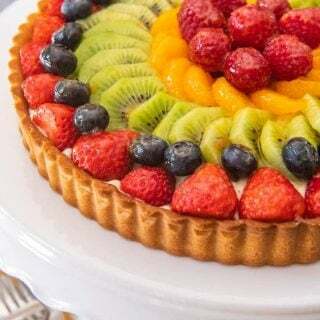 Paul is obsessed with these and they are a favorite option whenever he needs me to make something for him to take to work or to a church meeting. When you are mixing the butter, evaporated milk, and cake mix together, it will seem dry and crumbly. Just keep stirring and things will come together as the butter softens a bit, but it is still going to be a thick, more cookie-like batter. I tend to press the bottom layer into the pan with my hands since it doesn’t spread around, and then when it is time to do the top layer, I crumble it over the top or make little discs of batter and lay them gently over the melted caramel because there is no way you will be able to spread the batter around. And it’s totally okay if some of the caramel peeks through to the top layer anyway! 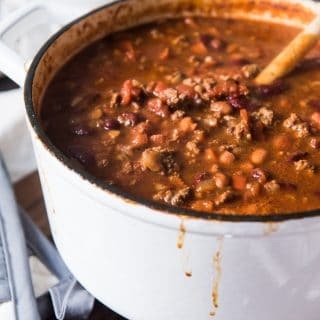 These will be good served slightly warm, but they are phenomenal when you chill them in the refrigerator and serve them cold! Preheat oven to 350 degrees. 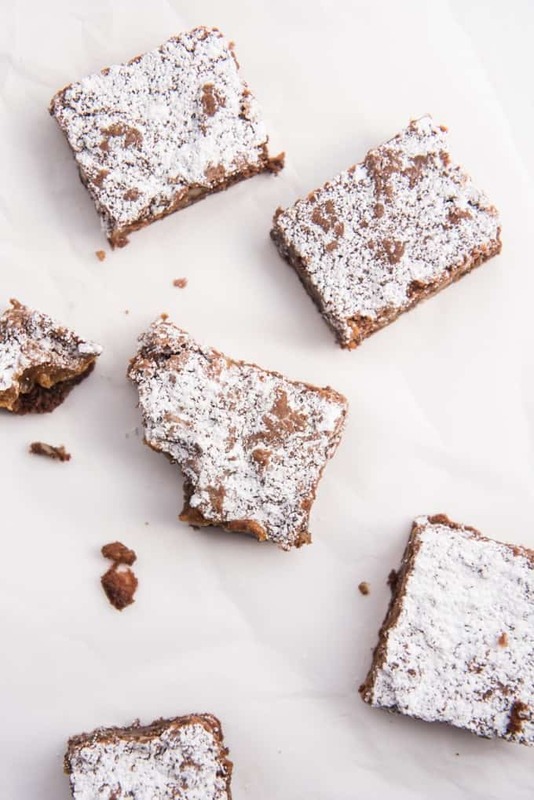 Prepare a 9x13-inch pan by lining it with a parchment paper sling with the paper hanging over the edge so that you can lift the brownies out after they have finished cooling for easy cutting or just spray with pan with cooking spray. Place the unwrapped caramels in a large glass bowl along with 1/2 cup of evaporated milk and set over a pan of simmering water. Do not let the water touch the bottom of the bowl. Stir occasionally until the caramels are completely melted and combined with the evaporated milk. It may take a while but you can work on the brownie batter while the caramels are melting. While caramels are melting, combine the cake mix, softened butter, and 1/3 cup of evaporated milk in a large bowl and mix together using a large spoon until it all comes together. This brownie batter will be very thick, more like cookie dough. 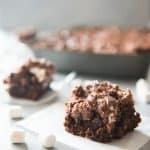 Divide the brownie batter in half and crumble or press half of the mixture into the bottom of the prepared 9x13-inch pan, then bake in the preheated oven for 8-10 minutes until slightly set. Remove from the oven and immediately sprinkle with 1/2 cup of chocolate chips. Pour the melted caramel over the top, then crumble the rest of the brownie batter on top of the caramel or use your fingers to make small discs of brownie batter to gently lay on top of the caramel layer. It's okay if some of the caramel peeks through. Return the brownies to the oven and bake for an additional 20-25 minutes, until the top is set. Remove from oven and allow the brownies to cool to room temperature. Cover with plastic wrap and refrigerate brownies for several hours until they are well-chilled. 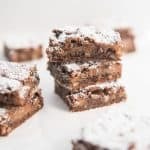 When ready to serve, dust generously with powdered sugar and cut into small rectangles. Boxed mixes can be so useful, and I agree, that texture can’t be beat! We can’t do it all semi-homemade is a life saver. 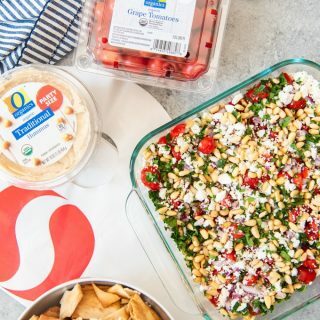 These look delish and have all of my favorite things in them! I’ve never added caramel in my brownies! Must be gorgeously delicious! Oh man, these look GOOD! Love the caramel filling, and I am so there with you on the rainbow chip frosting. It’s the only frosting I still buy from a can, because it’s just so tasty! I know! Same here – there is always a can of it in my pantry, just in case. 🙂 I’m so glad they brought it back! These look delicious! I love a good brownie!